Pictured from L to R; Back Row: Board Secretary – Ms. Annet Mactavious, Managing Director/CEO – Robert Mathavious, Commissioners Ian Smith and Jonathan Fietcher. Middle Row: Deputy Chairman – Colin O’Neal and Commissioners Denise Reovan and Richard Peters. Front Row: Chairman – Robin Gaul. Not pictured Commissioner Edward Price. 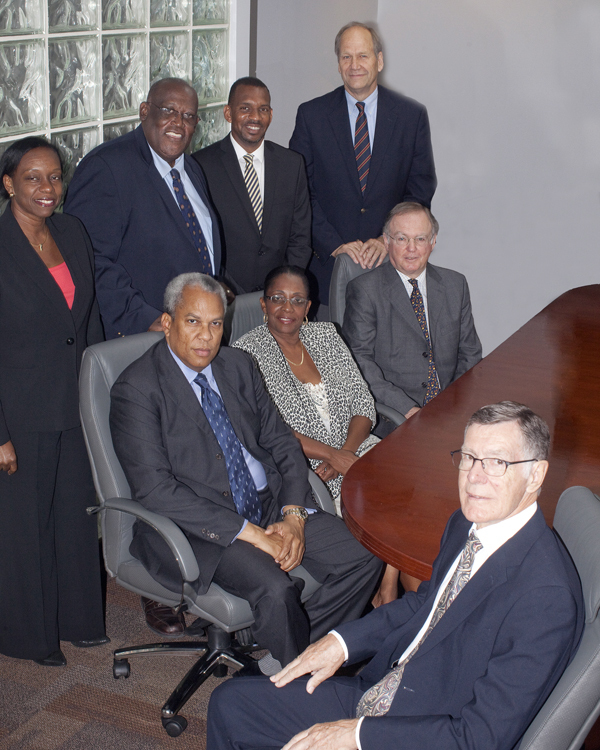 Tortola, British Virgin Islands – 13 November, 2014 – The British Virgin Islands Financial Services Commission today announced the appointments of five new Commissioners to its Board. The new members of the Board of Commissioners were appointed by Cabinet effective 1 October, 2014 as required by Section 5(2) of the Financial Services Commission Act, 2001 (the “Act”). The newly appointed Commissioners are Ms. Denise Reovan, Mr. Ian Smith, Mr. Richard Peters and external Commissioners, Mr. Jonathan Fietcher and Mr. Edward Price. The FSC Act provides for the appointment of two external Commissioners to be appointed from outside the Territory. Capital Markets at the IMF and Senior Deputy Comptroller for International and Economic Affairs at the US Office of the Comptroller of the Currency. Mr. Edward Price is a senior financial industry executive and regulator who has worked for many years in the US and Canada. Mr. Price has vast experience in the areas of banking and insurance supervision, derivatives and risk management and he currently serves as the Deputy Superintendent at the Office of the Superintendent of Financial Institutions in Canada.